Doctors treating Otto Warmbier, the American college student who was detained by the North Korean regime while on a group tour there last year, said today that he is suffering from a severe brain injury and is in a state of "unresponsive wakefulness." The regime returned 22-year-old Warmbier to the United States on Tuesday, after he spent 17 months in a North Korean prison for allegedly trying to steal a government poster during his trip. The United States Department of State warns that “numerous” foreigners are held in detention in North Korea for extended periods of time without charges. Americans are allowed to visit the secretive country, but there are many reasons to be wary of tour groups promising safe vacations to North Korea. As Warmbier's imprisonment over a poster shows, North Korea “imposes unduly harsh sentences for actions that would not be considered crimes in the United States,” the Department of State warns would-be tourists. Gary Locke, a former U.S. ambassador to China, has said that North Korea uses Americans in detention as “bargaining chips.” Independent human rights organizations have also warned that Americans face danger of being arrested and used as political pawns by the North Korean government. All of which makes the advertising hawked by the tour group that Warmbier had traveled with the more puzzling. The company that brought Warmbier to North Korea addresses safety concerns on the “North Korea FAQ” section of their website. Young Pioneer Tours, a tour group founded by a 36-year-old British man named Gareth Johnson, promises tourists worldwide the chance to visit unusual, off-the-beaten path locations at an affordable price. The company's North Korea tour starts and ends in China, which Warmbier had reportedly been visiting when he decided to add an unplanned North Korea excursion to his trip. In online marketing materials, Young Pioneer Tours describes North Korea as a country with excellent beer and fascinating sites, though they warn that customers cannot travel alone and must always be accompanied by guides. “Even during tense political moments, tourism to the DPRK (Democratic Peoples Republic of Korea) is never affected,” the company adds. The North Korea FAQ page makes no reference to Warmbier’s January 2016 arrest at the Pyongyang International Airport as he was trying to board a plane home with his Young Pioneer Tours group. The company has not yet returned an interview request from ConsumerAffairs. A "speedy and satisfactory outcome"
Public statements that the company made shortly after Warmbier’s arrest suggested that they tried to free him from detainment, though Young Pioneer Tours stopped short of criticizing the North Korean government for imprisoning Warmbier or condemning his arrest. 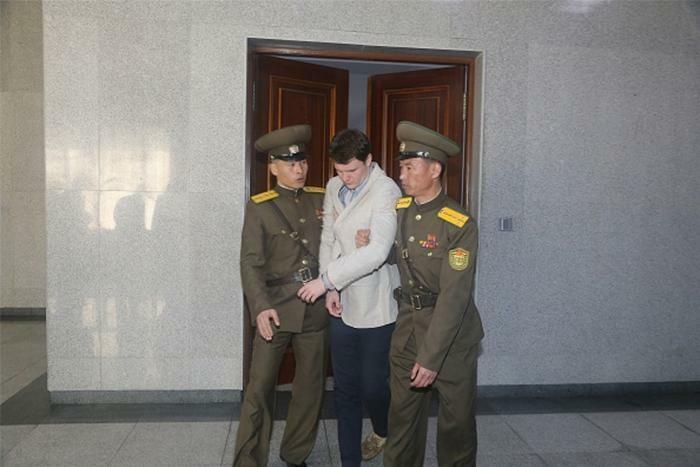 In fact, when the media first learned that an American tourist had been arrested at the North Korean airport for not-yet-known reasons, Warmbier’s tour guide speculated that Otto was in trouble for an incident that occurred at their hotel. "What happened, happened at the hotel and my belief is that Otto kept it to himself out of hope it might go unnoticed," Young Pioneers’ tour leader Charlotte Guttridge told Reuters at the time. In a confession that Warmbier’s father said was likely coerced, he appeared on state television the following month to say that he tried to steal a propaganda poster from the hotel where he stayed in exchange for a financial reward. Regime officials later released footage showing a person removing a poster from a wall, but poor lighting makes it impossible to verify the identify of the person in the video. Warmbier was ultimately convicted of hostile acts against the North Korean government after an hour-long trial and sentenced to 15 years of hard labor. Human Rights Watch Asia director Phil Robertson described Warmbier’s arrest and sentence as “political hostage-taking,” echoing warnings made by United States officials that American visitors are at risk of being arrested at random. “When North Korea gets into a diplomatic dispute with the U.S. government, they like to grab any American they can find and use them as bargaining chips,” Robertson said. None of those political or human rights warnings were mentioned on the Young Pioneer Tours Instagram page, which around the time when Warmbier’s ordeal made national news was instead showing tour leaders saluting in the Chilbo Sea or next to national statues, enjoying the view outside their high-rise hotel in Pyongyang, drinking local beer and learning how to make Kimchi. Company founder Gareth Johnson told VICE in an interview later that year that he could not discuss Warmbier’s situation out of respect for his family. But on a person identified by the website TripAdvisor as a company representative did discuss Warmbier's case and defended the tour group’s safety record. That “speedy and satisfactory outcome” that Young Pioneer Tours claimed it was working on never happened. Doctors said in a news conference Thursday that Warmbier has not "engaged in any purposeful movements" since arriving home. The North Korean government claims that Warmbier’s condition resulted from taking a sleeping pill after suffering botulism, but his family and doctors cast doubt on that scenario. The Department of State last year wrote that at least 16 Americans have been detained in North Korea. Americans who have been imprisoned and later released publicly described being kept tiny dark cells with little food or water. A 2014 United Nations investigation found that North Korea’s own citizens are often starved, tortured, raped and executed while in detention.